Product Videos - Click here to see Green Stuff work!! 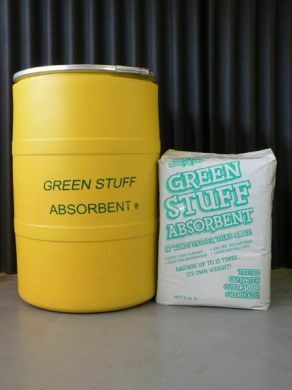 Green Absorbents specializes in providing environmentally friendly liquid & chemical absorbents. Non-mineral phenolic resin absorbents for the cleanup of spills & leaks & for the removal of processing waste. Compatible with virtually any chemical, green stuff absorbent's phenolic foam granules provide greater absorption capacity. With the unusual holding power of Green Absorbents, response teams simply use much less absorbent material when compared to alternative clay/litter type products. This results in less space required for absorbent supply in each response vehicle. Since less absorbent is used in clean up, much less labor is required overall. Extremely light & absorbs up to 15 times its weight. Quick absorbency for pick up of gasoline, diesel fuel & motor oil spills. Non-toxic absorbent, non-biodegradable absorbent & hazardous material absorbents, passes tests for hazardous material waste disposal at approved landfills & for approved incineration operations. Applications include fire & hazardous material response, paints & coatings absorption, airports, rubber & plastics, environmental control, transportation, agriculture, chemical processing, automotive, petroleum, hospitals, food processing, military operations, pharmaceuticals, plant maintenance, sanitation, bus depots, industrial waste management, household & garden. Also usable as a fuel blend with a content capacity of up to 13,000 BTUs per pound when paints, oils, greases, inks, coatings, solvents & adhesives are solidified with Green Stuff.